Image of The Anti-Corruption Book, shared by @AlexPulidoG on his public Twitter profile. In Mexico, the fight against corruption has inspired the creation of a think tank, throwing tomatoes at corrupt politicians through the #JitomatazoMx campaign, and most recently: a comic book. Stylized along the lines of the iconic romance series The Cowboy Book, which is set in the “wild west” at the end of the 19th century, the Anti-Corruption Book is quickly getting the reputation of being “The Cowboy Book of Anti-Corruption.” The laboratory of public politics Ethos launched the Anti-Corruption Book in March 2017, and it shows how citizens can avoid becoming victims, or even accomplices, to corruption in everyday situations. Cabe destacar que el Libro Vaquero tiene sus orígenes en 1978, y alcanza un tiraje de 118,000 ejemplares de manera quincenal. La misma cantidad de ejemplares del Libro Anticorrupción serán encartados en la próxima edición. Otros 20,000 ejemplares de las historietas sobre corrupción serán distribuidos en espacios públicos y universidades con ayuda de integrantes de la sociedad civil. It seems fit to highlight that Cowboy Book has it’s origins in 1978, and will achieve the printing of 118,00 copies on a fortnightly basis. The same amount of the Anti-corruption Book copies will be included the next edition. Another 20,000 copies of the anti-corruption comic strips will be distributed in public spaces and universities with the support of members of civil society. Con el objetivo de informar y empoderar a la ciudadanía para evitar la corrupción y denunciar los casos que vean, Ethos Laboratorio presentó el Libro Vaquero Anticorrupción este miércoles 1 de marzo. En las páginas del Libro Vaquero Anticorrupción, los lectores encontrarán historias que servirán para informar, con lenguaje coloquial, sobre el problema de la corrupción y para explicar cómo funciona el Sistema Nacional Anticorrupción. With the objective to inform and empower citizens in order to avoid and report any cases of corruption witnessed, Ethos Laboratorio presented el Libro Vaquero Anticorruption this Wednesday 1 March. 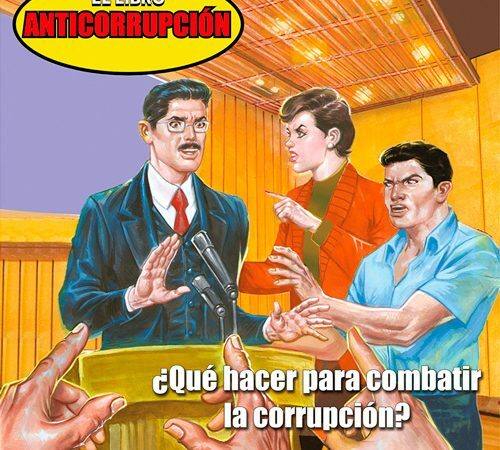 Within the pages of el Libro Vaquero Anticorruption, readers will find stories written in colloquial language that will inform them about the problem of corruption and of how the National Anticorruption System works. The National Anti-corruption System is a framework of public institutions (some existing, others to be created) that looks to prevent, detect and penalize the corrupt actions committed by society and Mexican public servants. It’s creation was announced in May 2015. Our Anti-Corruption Cowboy Book. We tell of situations of abuse and complicity through comic-strips. The complete works can be found free of charge on the Ethos website.